Summer sniffles? Beat that cold quickly! home > health > immune system > Summer sniffles? Beat that cold quickly! The onset of sniffles, sneezes and a sore throat is inconvenient at any time of year but especially in the summer when there are holidays and good weather to enjoy. Therefore, to help you beat any colds that arise in the warmer months, I’ve put together a list of simple remedies for summer colds. By putting these suggestions in place you will quickly be back out in the sunshine rather than tucked up in bed with a box of tissues under your arm! What is a summer cold? Although there are some similarities between summer and winter colds in terms of the symptoms experienced and their duration, there are a number of differences too. Whilst winter colds are caused by the rhinovirus for example, summer ones arise due to the enterovirus. This can be nastier as it often leads to flu-like symptoms such as fatigue, fever and achy joints, as well as the usual sore throat, coughing, runny nose and blocked nose. It is also common for this virus to re-occur two or three times a year meaning that most people don’t just experience one summer cold but a number of them. A summer cold can often be mistaken for allergies as they share a few of the same symptoms however, there are a few things that distinguish the two. Allergies often involve watery, itchy and red eyes for example, while summer colds do not. Also, allergies tend to fluctuate depending on things like the weather, the pollen count and the amount of trees, weeds and grass in the area. So, with these things in mind you should be able to distinguish whether or not you have a summer cold. So, vitamin C helps to strengthen the immune system and in doing so it could reduce the length of your summer cold. Therefore, the next question is how can you up your vitamin C intake? Although there are lots of foods that contain vitamin C, during a cold you may wish to increase your intake further by trying a supplement. If so, I’d advise choosing one that contains naturally-occurring vitamin C rather than one that is made synthetically. Our Nature-C tablets are a good option as these are made from a variety of foods including blackcurrants, passion fruit, Sea buckthorn and lemon. If you’ve read any of my other blogs on colds and flu then you’ll have definitely heard about Echinacea! This vibrant plant supports and strengthens the immune system which, in turn, helps to maintain the body’s resistance to summer colds. So, when the sniffles strike, you should definitely give Echinacea a go and our Echinaforce Echinacea Drops are a great place to start! These are unique as they are made from fresh extracts of the Echinacea plant meaning they do not lose any of their beneficial properties during the production process. From skin health to kidney function, a high, regular intake of water is important for many aspects of our health. However, during a troublesome summer cold, it is even more important that you drink lots of water. Not only is the weather warmer in the summer months thus causing us to sweat more and lose fluids quicker, cold symptoms like sweating and a runny nose can exasperate the problem. Therefore, in order to avoid dehydration these fluids must be replaced by drinking lots of water – 1.5-2l is the recommended daily amount. Plus remember, drinks like tea, coffee and alcohol can actually dehydrate you so try to avoid these whilst battling your cold. Whether it’s a blocked or runny nose, summer colds regularly cause nasal symptoms. So, in order to treat these you have a couple of options, one of which is to inhale steam. Steam contains both heat and water which can thin the mucus in your sinuses and soothe irritated nasal passages. This means that warm baths and showers are in order! Another natural option for treating congestion is our Sinuforce Nasal Spray. This contains menthol, peppermint oil, chamomile oil and eucalyptus which has a soothing effect on the nose. Although there are a number of treatments to relieve coughs quickly, a natural option would be either our Bronchoforce Chesty Cough Remedy or our Bronchosan Tickly Cough Remedy. Depending on the type of cough you have, these will help ease irritation in the respiratory tract plus they are free from any side effects like drowsiness which are commonly experienced with traditional cough remedies. There are a range of herbal teas that can help fight summer colds quickly so whatever your tastes, there will be one to suit you! Our Echinacea Hot Drink is good place to start as it contains Echinacea which, as I already mentioned, is really beneficial if you are suffering from a cold. That’s not all though as it is both soothing and palatable, helping to ease symptoms like a sore throat. Another option is green tea which is loaded with antioxidants called catechins which fight disease, as well as cold viruses. However, if you don’t like the sound of either of these options then you could just mix some warm water with honey and lemon. The steam from this will help symptoms in the nose whilst honey helps soothe the throat. Plus, with the addition of a little lemon, overall this drink is very pleasant-tasting. Many people will find that their summer colds last longer than a winter one but this is partly to do with the fact that we are more active in the summer months meaning we don’t give our bodies the space to recover. So, if you are suffering from a summer cold try to take a break from your regular exercise regime and ensure you get plenty of sleep. Plus, don’t immediately start exercising at the first sign that your cold has gone – it will take time for it to recover completely. A summer cold usually clears up ten days to two weeks after you first experience symptoms so as well as following the steps above, you need to give yourself time to recover. If your symptoms do not clear up after two weeks though, do arrange to see your doctor for further advice. Looking for a herbal remedy to support the immune system, helping to maintain the body's resistance to infections such as cold and flu? Then look no further than Echinaforce - Echinacea drops! To find local independent stores in your area that sell Echinaforce, simply type your postcode below. Echinaforce® Echinacea Hot Drink. Soothing and palatable hot drink. Is sinusitis causing my headache? How long does bronchitis last and will it go away on its own? Take our quick quiz to discover just how healthy your immune system is, as well as some useful information about your general health and wellbeing! As the A. Vogel Immune System expert, I recommend Echinaforce® to support immune health and help maintain the body’s resistance to infection. Not getting enough sleep lowers your immune function. 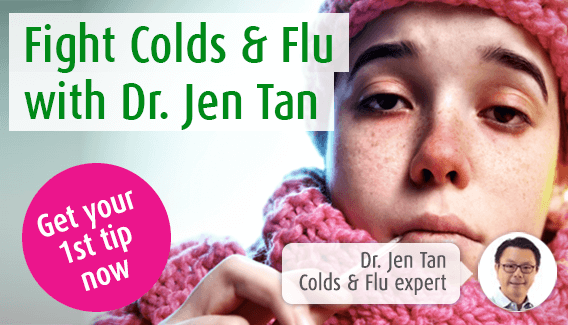 The body needs a good 7 hours sleep to stay strong enough to fight off colds & flu!